Micross offers the most comprehensive range of component modification services from any one source. We’ve been delivering mission-critical best-in-class products & services to hi-rel customers for over 40 years and remain committed to always providing complete capabilities to meet a customer’s specific requirement or application. Tape and reel is one method to transport the die to the customer. The tape has cavities that each hold a single die. As with waffle pack selection, the x, y, and z dimensions are selected for the die size, so that the die will not rotate or flip. 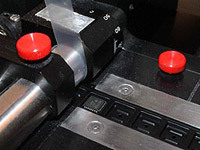 Typically, the sawn wafer is mounted on a pick and place machine, which places the die into the cavity. As the tape is filled with die and is being reeled onto the receiving reel, a pressure sensitive cover tape is pressed down to seal the cavity, securing the die safely within. The tape reel can then be directly loaded into a customer's automated assembly equipment to assemble. Micross is one of the few vendors with 3D scanning equipment. 3D scanning allows for minimum handling and maximizing in-line vision inspection for tray-to-tray, tray-to-tube, trap-to-tape, tube-to-tube, and tube to-tape. Our 3D inspection capabilities include coplanarity, bent leads, sweep, pitch, standoff, ball height, ball diameter and true position of most package types including OIC, QFN, TSOP, TSSOP, SSOP, MSOP, SOJ, PLCC, QFP and BGA. Our state-of-the-art quality systems meet or exceed EIA-481. Component baking and dry packing in line with manufacturer guidelines for all moisture sensitive components. 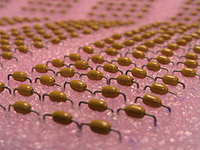 Components can be cropped, formed and packaged ready for use in assembly.